The BRYN track light features a two tone matte black and gold finish and functional track heads that are easily adjustable to illuminate objects in your room. This fixture is complemented by metal cages for a unique look. Ideal for the bedroom, kitchen and living room. It features Easy Connect technology for quick hassle free installations. The R036-03 mini - pot downlight featured in gold, requires no mounting hardware. Mounted with butterfly springs, the R036-03 is supplied with 36 In. of wire, quick connect plug and mini can housing. Transformer sold separately. Cut hole size needed is 2 In. Impart vintage styling to your outdoor space while you illuminate it. This vintage style battery operated outdoor Wire Diamond pendant light, with black metal design, Edison style bulb compliment the nostalgic, vintage look of this fixture. Use this outdoor globe pendant to update and illuminate your gazebo, canopy, porch or pergola. Convenient, no wires needed. 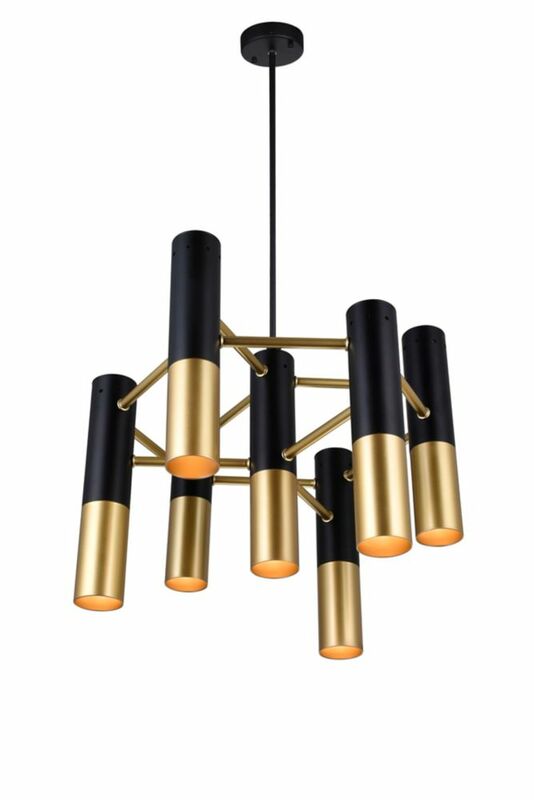 Anem 17-inch 7 Light Chandeleir with Matte Black & Satin Gold Finish This breathtaking 7 Light Chandeleir with Matte Black & Satin Gold Finish is a beautiful piece from our Anem Collection. With its sophisticated beauty and stunning details, it is sure to add the perfect touch to your dicor.